It's not only a Zionist Olympic logo. It's a Gay, Freemason Zionist logo! It turns out that the London Olympic 2012 logo is not merely Zionist. It's even worse! Baharm Afsharzadeh, the secretary general of Iran’s Olympic Committee told reporters the logo depicts the word ZION, a totally irrelevant symbol for what it is supposed to depict i.e. the spirit of Olympics. ‘We had to show protest against the measure. We intend to write a letter to Asian Olympic Council to call for them to follow up on the issue more seriously,’ said Afsharzadeh in a report published by Iranian Student News Agency ISNA, Monday. According to Afsharzadeh, the so-called designer of this logo has a proven track record of being affiliated to certain well-known Zionist organizations and Freemasons. The logo’s rudimentary and rather silly design shows the word ZION written in off pink color - a much revered color theme associated with some deviated Western-based circles. Yet it is not clear, why the British Olympic Committee has chosen this design as the main logo of the Olympic games which is to be held in London, England in August 2012. Several countries including some British organizations have protested against this logo, finding it pejorative as well as totally irrelevant to spirit of Olympic games. ‘This is the first time that it has happened in the history of Olympic. Zionists have exercised influence in Britain and based on our information, designer of the summer games' logo has been a Zionist organization linked to Freemasons,’ Afsharzadeh said. Anti-semitic and anti-gay sentiments all rolled up into one nice pink kerfuffle! 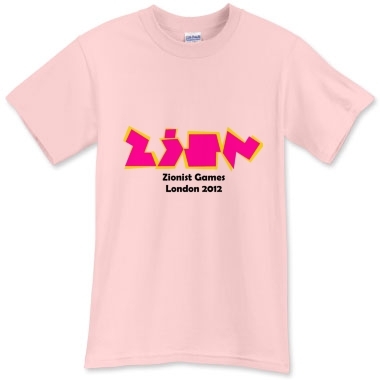 UPDATE: You can jump on the bandwagon and buy your own T-shirt with the Zion logo!